WHEN: Tuesday, Feb. 20, 1 pm. BACKGROUND: The First District Court of Appeal on Jan. 25 delivered a decision that abolishes the practice of using high money bail to detain poor people without giving them detention hearings, as required by the U.S. Constitution. The case, brought by the San Francisco Public Defender’s Office and Civil Rights Corps, revolved around the detention of 64-year-old Kenneth Humphrey, held on $350,000 bail (initially set at $600,000) for allegedly stealing $5 and a bottle of cologne. Humphrey “is entitled to a new bail hearing at which the court inquires into and determines his ability to pay, considers non-monetary alternatives to money bail, and, if it determines [he] is unable to afford the amount of bail the court finds necessary, follows the procedures and makes the findings necessary for a valid order of detention,” the appellate court stated. Over 60 percent of those detained in California jails are there pretrial — incarcerated due to their inability to afford the high bail amount. “The Humphrey decision is a game changer for Californians and a major crack in the foundation for the exploitive cash bail industry. We are kicking off a statewide movement to demand judges follow the law and hold new bail hearings for those locked up simply because they are too poor to purchase their freedom. The time for justice and action is now,” says San Francisco Public Defender Jeff Adachi. 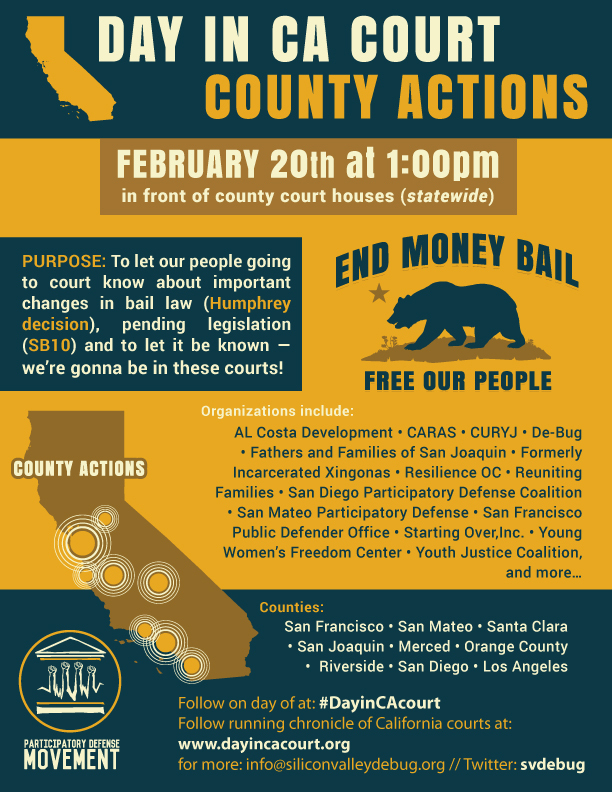 In effort to build off the momentum of the ruling, educate the public of the change, and build towards further improvements through SB10 now going through the legislature — community organizations, families of the incarcerated, and public defenders will rally in front of county courthouses. Organizers will also go into court to monitor the hearings, to ensure the court is respecting the rights of those facing arraignment and bail hearings. 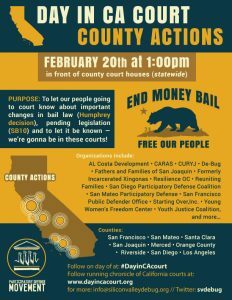 Organizers will be using the hashtag #DayinCACourt through their social media handles across the state from their respective counties during the rallies, and launching a dayincacourt.org a running blog to chronicle California’s courts and bail reform efforts from the perspective of the community.